Before we get to each of these wines, a quick comment regarding where they are grown. 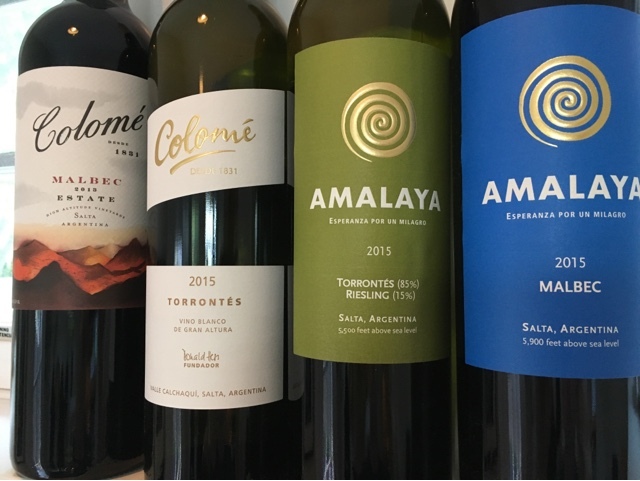 If you look carefully in the picture above, you can see that they indicate that they all come from high-altitude Vineyards in the Salta (spanish for "jump") region. Well, that is an understatement. The first Malbec reviewed below is from vineyards at 5900 feet above sea level. Whaaa???? For comparison, the Val d,Aosta region of Italy is home to Europe's highest altitude vineyards which are shy of 4000 feet above sea level. What changes the higher you go? As it turns out, quite a bit. The air gets thinner, the sunshine more plentiful, and days get longer. It also tends to be a drier and more austere environment all around. This means that, in addition to forcing the routes to go deeper for sustenance and creating more opportunity for phenolic development, it's also a less hospitable place for pests. These all translate into not so subtle differences in the wines. Read on for details. Another quick disclaimer: malbecs and torrontes have never been my favorites. In fact, I've deliberately steered clear of them because my experiences have been lackluster. These may change things, though. Seductive, high-energy aromatics of sweet honeysuckle over wet slate beckon. Very alluring. Light bodied and bracing on the attack, the soft, pretty fruit gets a bite of acidity to offset the nectar-like flavor and keep the finish clean. A disco ball on Friday night. The addition of 15% riesling is a simple stroke of brilliance. Softening torrontes' bite while enhancing the blossoming aromatics, these unexpected bedfellows help elevate the package to another level. As an added bonus, the profile of the resulting wine makes it a companionable addition to a huge spectrum of cuisines - especially summer dishes. Great value. Very deep in color and density in the glass. Mysterious looking. Aromatics channel a refined elegance with a preview of the mouth-coating tannins to come. (And do they ever.) Tight and potent, there's blue-green vegetal character at the edges and a finish that tempts. Delivers a lot without getting anywhere yet close to overblown or extracted . Those with patience to lay a few of these bottles down should be rewarded in 3-5 years. While I will confess to not being a big Malbec fan, all of my complaints for the way the wine is typically bottled don't apply to this one. Absent is the harsh, garish nature often present. Instead, this is a fresh, feminine red wine that bears a close resemblance to many from southern France. It's got tight fruit framed by proportional acidity, a combination that makes for terrific versatility, especially around summertime menus. Easy drinking and chewy tannins to boot.